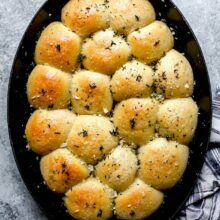 Parker House Rolls with garlic, herbs, and a sprinkling of sea salt are a great addition to any dinner menu. The dinner rolls are soft, buttery, and SO delicious. 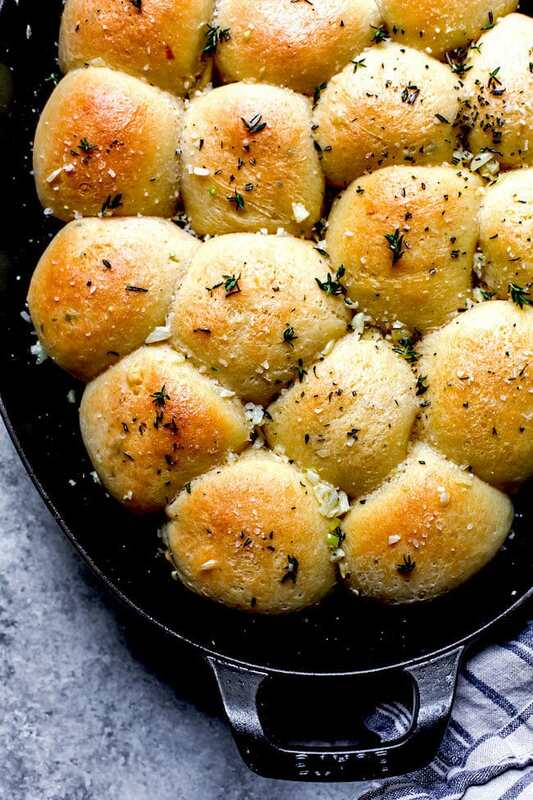 I think every meal should have warm dinner rolls served on the side. Who is with me? 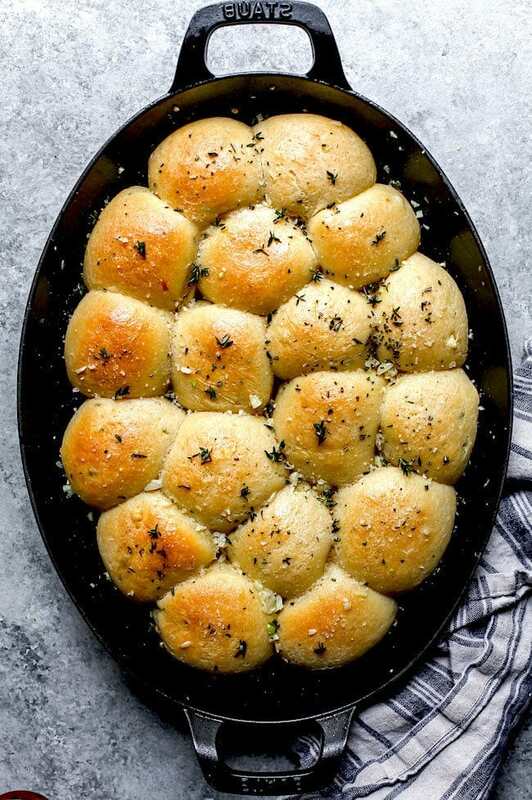 I am a sucker for homemade rolls and these Garlic Herb Parker House Rolls are perfection! My mouth is watering just thinking about them. They are soft, tender, buttery, herby, salty…I bet your mouth is watering now too? Well, let’s not waste any time, let’s make some rolls! It is time to get our carbs on! This Parker House Roll recipe comes from The Staub Cookbook, one of my current favorites. I LOVE Staub everything so I was so excited when they came out with their own cookbook. Fun fact, my friend Amanda Frederickson helped write the book and she makes the most amazing food so I knew the book was going to be amazing. Oh, and another fun fact, Colin Price, our cookbook photographer also shot The Staub Cookbook. So yeah, it is gorgeous! It is an all around fantastic cookbook! And you will want to make everything in the book after you make the Parker House Rolls. They are so good! I know a lot of people are afraid of working with yeast, but don’t let the yeast scare you. This roll recipe is simple. Sure, it takes a little time because the rolls have to rise, but you can take a nap while they are rising, you have my permission. See, you can do this! A nap AND delicious rolls? WINNING! First, check the date on your yeast to make sure it hasn’t expired. For this recipe, you need 2 1/4 teaspoons active dry yeast, which is one envelope. Melt 1/2 cup of the butter over medium heat and add the milk and sugar. Stir to combine. Using a thermometer, check the temperature of the mixture; when it’s 105 degrees F, remove it from the heat. Don’t get the mixture too hot or it will kill the yeast. Add the yeast to the mixture and let it sit for about 5 minutes, until the mixture is bubbly. If the mixture doesn’t bubble and doesn’t smell “yeasty,” you will have to throw it out and start over. Use a stand mixer with the dough hook attachment to mix and knead the roll dough. If you don’t have a stand mixer, you can mix and knead by hand, but the mixer makes it a lot easier. Combine the yeast mixture with 4 cups of flour and knead for 1 minute. Add the egg, 1 1/2 tablespoons of the chopped herbs, half of the garlic, and kosher salt, and continue kneading on low until the dough is soft and smooth, tacky but not sticky. If the dough is too wet add the remaining 1/4 cup of flour. When the dough has risen, gently punch down the dough and cut the dough into 4 equal pieces. Shape the dough into small balls, about 2 ounces each, making 18 dough balls. Butter a large cast-iron roasting pan or baking dish and place the dough balls into the dish. Let the dough rise for 30 minutes. While the dough is rising, preheat the oven to 350 degrees F. so you are ready to bake! Bake the rolls for 25 to 30 minutes, or until the rolls are golden brown. Warning, your house will smell AMAZING! Melt the remaining butter with the remaining garlic. Brush the warm rolls with the melted garlic butter and top with remaining herbs and flaky sea salt. 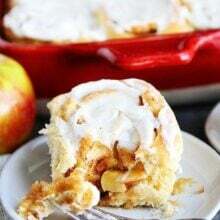 Serve warm and you will be in roll heaven! 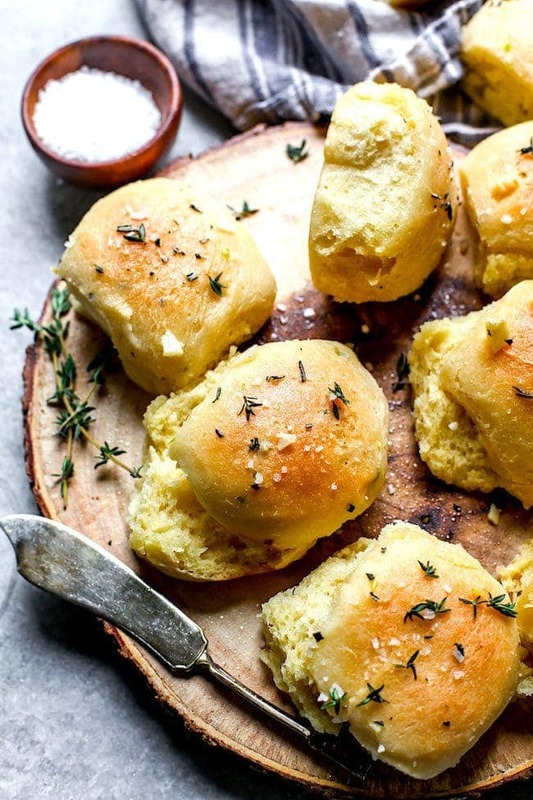 Warm, buttery, Parker House rolls made with fresh herbs, garlic, and a sprinkling of sea salt are the ultimate dinner rolls. The garlic and herbs add SO much flavor and the kick of sea salt will have everyone coming back for a second or third roll. Warning, you might want to double the recipe if you have a big family. 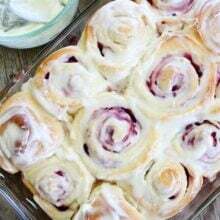 These rolls always go quickly at family dinners and holidays! We love making Parker House Rolls for Easter, Thanksgiving, Christmas, or just because we are craving carbs. They are good with any meal! Enjoy! In a small pan, melt 1/2 cup of the butter over medium heat. Add the milk and sugar and stir to combine. Using a thermometer, check the temperature of the butter and milk mixture; when it’s 105 degrees F, remove from the heat. Add the yeast and stir to dissolve. Let the yeast bloom for about 5 minutes, until the mixture is bubbly. If mixture doesn’t bubble and smell “yeasty,” throw it out and start over. Pour the yeast mixture into the bowl of a stand mixer fitted with the dough hook. Add 4 cups of flour. Turn the mixer to low and knead until just combined, about 1 minute. Add the egg, 1 1/2 tablespoons of the chopped herbs, half of the garlic, and the kosher salt, and continue kneading on low speed until soft and smooth, tacky but not sticky, adding the remaining 1/4 cup flour if the dough is too wet. On a lightly floured surface, shape the dough into a ball and place it in a large greased bowl. Cover with plastic wrap and let the dough rise in a warm, draft-free area for about 1 1/2 hours, until doubled in size. Remove the plastic wrap and gently punch down the dough. Cut the dough into 4 equal pieces, then shape into small balls about 2 ounces each for 18 dough balls in total. Butter a large cast-iron roasting pan or baking dish and place the shaped dough into the dish. Let the dough rise for 30 minutes. 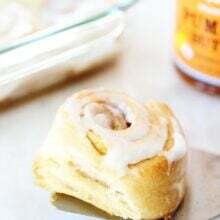 While the dough is rising, preheat the oven to 350 degrees F.
Bake the rolls for 25 to 30 minutes, or until golden brown. In a small pan or in the microwave, melt the remaining 1/4 cup butter with the remaining garlic. Gently brush the dough with the melted garlic butter, top with remaining herbs, and sprinkle with flaky sea salt. Serve warm. These look so good! Perfect for Easter! 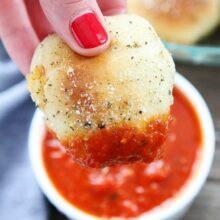 Could these be made ahead and frozen before baked? Yes! Let the dough rise and then roll them into rolls and freeze. Defrost and let them rise.